We went to the Mariners game two nights ago. Our friend Judy and her family have had season tickets behind home plate since the Mariners’ first season, and from time to time we have been fortunate to sit in their seats. Tuesday night our Glaswegian friends arrived from Scotland to stay with us and Wednesday morning Judy offered her tickets for Friday’s game. That would be seating for four, but if Jessica wanted to join us, there would be seven. So I went online Wednesday and managed to get three more tickets that, to my astonishment, were even better than Judy’s. Well, better is in the eye of the beholder. Some may argue, as with theater tickets, that you don’t want to be too close. A few rows farther back, with additional elevation, gives a better perspective. Maybe so. But anyway, we had four tickets just a few feet to the first-base side of home plate, 18 rows back, and 3 more another section over toward first base, 9 rows back. Plus, as we discovered when we got there, the two sets of seats were just three seats in — on opposite sides — from a shared aisle. We could hardly have hoped to be closer. I take this as a sign of just how poorly the Mariners are doing. Can you imagine getting such good seats two days ahead of time for a game against the Red Sox? The only bigger draw in the American League is the Yankees. Maybe. I’m not sure that they are. As we found when we arrived, there were far more people wearing Red Sox jerseys or caps or t-shirts than wearing Mariner gear. Ortiz and Papelbon and Pedroia and Youkilis and Beckett. And a retro Williams shirt. And Yaz. Yet we got seats 9 rows back between home plate and the dugout. I sat in one of Judy’s seats, 18 rows back. After sitting halfway up the third deck in right field for two games in May, I was astonished at how much more engaged I was for this game. I mean, I expected to be engaged, but the difference was enormous. And it was a close game, with the Red Sox taking a 2-1 lead on Bill Hall’s home run off starter Jason Vargas in the 7th, and that’s how the game ended.
. . . things deteriorated from there. In the end, players were jumping in left and right to separate the two and pull each other away. Jose Lopez had his jersey pulled off when a coach yanked him away from the fray. We could not determine whether Lopez was part of the initial fight or a separate one, though the more likely explanation seems that he was merely one of those intervening between Wakamatsu and Figgins. A television replay I saw seemed to suggest that. Wakamatsu could not duck the media, so he stood and took questions about it. I asked him why he’d picked this moment to bench a player when there have been numerous instances of bad base running all week and poor situational hitting all week. So much for having great seats. We were pretty close to the Mariner dugout, but all this occurred hidden from us. 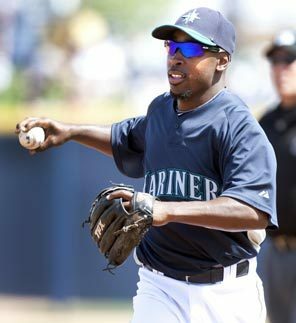 Our only clue that something was amiss was Josh Wilson’s appearance to pinch hit for Figgins in the bottom of the inning. Perhaps the highlight of the game was when I went down to row 9 to join Joel, Jessica, and Liam in the ninth inning. The players were so close. The Mariner on-deck circle seemed close enough to touch. The field appeared level with our seats. As I noted earlier, this isn’t entirely for the good, but it sure makes you feel a part of the action. You know, I used to be an intense Red Sox fan, and I have my own supply of Red Sox gear. When we were about to head out for the game, with Mariner cap on, I reached into the closet for one of my old Red Sox caps. My plan was to alternate caps as the teams alternated at bats. This did not go over well with Joel, who grabbed the Red Sox cap and threw it in the back of the closet. After a short protest, I decided to bow to his wishes. After thirty years here, I’m now a Mariner fan. If I wasn’t sure, the crowd at the game helped me confirm it. I wasn’t too happy to see all those people in Ortiz and Papelbon and Pedroia and Youkilis and Beckett and Williams and Yaz jerseys. Red Sock go home.